England were knocked out of the Women's World Cup in heartbreaking fashion as Laura Bassett's injury-time own goal sent holders Japan into Sunday's final. The Lionesses were attempting to reach their first World Cup final and only England's second after the men's team's victory in 1966. 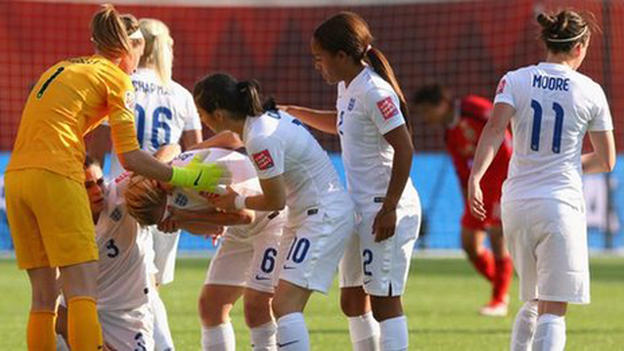 There was barely time for England to respond and Notts County defender Bassett burst into tears at the final whistle as her team-mates sunk to the turf. After making history by reaching the semi-finals for the first time, the manner of the defeat was cruel on Mark Sampson's side, who missed three good chances around the hour mark. Kelly Simmons - the Football Association's director of women's football - said before the game that the tournament had led England to "fall in love with the Lionesses". But that will be of little consolation as Japan prepare to face United States in a repeat of the 2011 final, which the Japanese won on penalties. England, meanwhile, will face Germany in Saturday's third-place play-off. Spurred on by a telephone call from the Duke of Cambridge prior to the match, England started confidently and Jodie Taylor almost scored in the first minute. There were early chances too for Toni Duggan, who replaced Karen Carney in the starting line-up. Japan, who have been likened to Barcelona for their passing style, took time to find their rhythm, but after 20 minutes the pattern of the game was set with the Nadeshiko dominating possession and England looking to break on the counter attack. As the world champions grew in confidence, they drew England out of their comfort zone and opened the scoring just after the half-hour mark. Left-back Claire Rafferty was caught out of position and pushed Saori Ariyoshi as she bore down on goal, though the initial contact appeared to be outside the box. Captain Miyama put the penalty confidently to Bardsley's right. England, who came from behind to beat Norway at the last-16 stage, did not trail long, and again the goal came from the spot. Former Chelsea striker Yuki Ogimi clipped Steph Houghton's left heel, although the contact seemed slight, and Williams scored her second penalty of the tournament. Sampson's side looked buoyed by that response and enjoyed a period of supremacy after the break. Duggan struck the bar from the edge of the box before substitute Ellen White drew a fine save from Ayumi Kaihori. Scott then headed wide following the resulting corner. England's ascendancy was thrown off course by an injury to Lucy Bronze, who had to be substituted just after the introduction of the lively Mana Iwabuchi. But they finished the stronger side and looked good to make an impact in extra time before Bassett's terrible misfortune.